The website for the Village of Hamburg boasts the tagline “Come to discover. Stay for the charm.” I’ve visited, and in the birthplace of the burger, I think a change to that tagline is worth considering. After all, in the town where the burger was invented, how could you not come to try one? 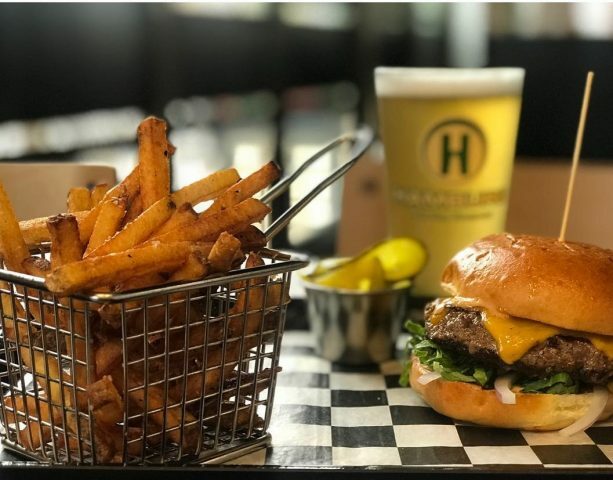 I’m talking about Hamburg, and though there is only one true “burger bar” in this vibrant little village south of Buffalo, there are plenty of spots to grab a hamburger and fries. When you’re done, take a stroll along the downtown corridor and discover retail shops, desserts galore, and shop owners who welcome you like a friend they’ve just been waiting to see. Juicy Burger Bar (1 Buffalo Street) is the spot to go for any kind of burger you could possibly dream up … they have basic burgers, and they have not-so-basic burgers: burgers with a stuffed banana pepper on top, a poutine burger, burgers with egg, beef on weck and Philly cheese steak look-a-likes, turkey burgers, barbeque burgers, and believe it or not, there’s more. Juicy is also like vegan burger paradise – there are not one but TWO vegan burger options to choose from! And while the black bean burger is a solid option, the falafel burger is one of the best burgers on the entire menu; the falafel is perfectly crunchy, it’s perfectly topped with light, fresh complements, and it comes with fries, so you still get the “burger and fries” experience. My recommendation: Start with the Plain Jane the first time you visit Juicy, and then branch out from there on subsequent visits. All the burgers are worthy, but starting with the basics helps you appreciate the true burger flavor, which by the way, is outstanding! Also, vegetarians and vegans, RUN DON’T WALK to Juicy if you’re looking for a burger experience that lets you be true to yourself. If you’re looking for more of a “beer and burgers” kind of meal, head to the Pour House (23 South Buffalo Street). Their Pour Burger is one of the best burgers around; it’s a classic, no frills, kind of burger. They’ll fix it to your liking – from rare (yes, it will be rare if that’s how you ask for it) to well done – and the pile of fresh cut fries will have you still picking at them long after you’ve claimed you’ve had enough. Beyond that, the service is always friendly and the drinks are always cold. My recommendation: Relax on a Saturday afternoon with a Pour Burger done medium rare, and a Southern Tier IPA. Mason’s Grille 52 at 52 Main Street is another popular spot. As a self-proclaimed “casual fine dining” establishment, you’ll get excellent service, a wide-ranging and creative menu, and of course, a burger worth writing home about. Their Triple Prime Burger is special because it’s a blend of three meats, so while vegetarians may want to stick with Juicy for their burger needs, the carnivores looking for max burger flavor MUST put Mason’s on their list. Topped with Gouda and an extra special aioli that adds bacon into the flavor mix, the Triple Prime Burger checks all the burger boxes. My recommendation: Grab a high top table in the bar area. Along with the Triple Prime Burger, order the Waffle Fries. Enjoy (thoroughly). watch the world go by, or the overlook down to 18 Mile Creek right in the middle of town, you can’t help but smile when taking it all in. Shopkeepers put out copper bowls filled with water so dogs can have a drink. Kids on bikes with fishing poles strapped to their backs whiz by you as you amble along. It’s part Americana, part Hipster, and you’re going to love it!